There are many problems with the healthcare system in The United States today, such as the cost. While The Affordable Care Act has attempted to address some of these problems, it has actually exacerbated them because some individuals are having to pay higher premiums to offset the costs of adding high-risk people to the pool, but not charging them a higher cost due to their pre-existing conditions. Not only that, these premiums have proven too expensive for young people. The result of this is that they wind up paying the tax imposed by the Affordable Care Act for not having health insurance, because it is cheaper than paying a health insurance premium, but still wind up being uninsured. 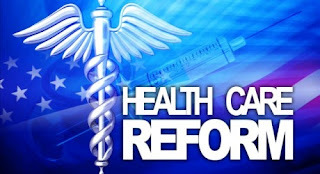 One solution that would solve this issue is replacing the tax refunds that individuals receive (usually through the Earned Income Tax Credit or Child Tax Credit), with a voucher for health insurance, or a health savings account for those who would like to choose that option. In return, Medicaid would be completely eliminated. This solution is able to replace Medicaid because the individuals and families who benefit from the Medicaid program are also the people who qualify for tax refunds by applying the EITC or Child Tax Credit. Let’s take a family of four, for example. The family's total income is $36,000/yr, with $7,000 taken per year in taxes. About $4,250 of this will be from the income tax, with about the first $18,000 of income being taxed at a 10% rate, and the other half being taxed at the 15% rate (in tax year 2016)(1). With a standard deduction of $12,600 (married filing jointly)(1), and personal and dependent exemptions of 16,200 (4,050 each in tax year 2016) (2), giving them a Gross Adjusted Income of 7,200. This would put them in the 10% bracket, so the correct amount owed would be $720. That would give them a tax refund of $3,530. However, the EITC, which in this case would be a Child Tax Credit, would be $2,895 (3). Therefore, the total voucher for health insurance (or a health savings account), would be $6,425. There are some individuals who would say that is not enough for health insurance for four people. I would counter this argument by proposing a couple ideas that could lower the cost of insurance, or perhaps be used as an alternative. First, of all people should stop treating insurance like a co-op. The point of insurance is only to use it when you need it, Ideally, it should not be used for preventive care, but for more expensive procedures and costs like prescriptions, emergency room visits and surgeries, following this suggestion would significantly reduce premiums for everyone. I suppose what I am getting at is that for a lot of individuals, a catastrophic plan and a health saving account for primary care doctor visits and lab tests might be a better option than full-insurance. Another idea would be to allow more competition by allowing individuals to purchase insurance across state lines. As a last resort, there could be a massive fundraising campaign at a national level (think gofundme, but on steroids), or several smaller efforts to make up the cost. Surely if one can raise over 1,000’s of dollars for an injured cat, how much more can we raise for our fellow man? Now, if we could only solve the Medicare problem, which is a whole other story entirely. As it stands, this could be viable solution in the area of healthcare reform, as well as one that saves taxpayer dollars and reduce the federal deficit. It provides access to healthcare for those with limited incomes, including those who aren’t able to get access under the Affordable Care Act due to the cost, and replaces a bloated government program. It’s a win-win, for Libertarians and for the country at large. This contribution is by Michael Howard.